ISBN 9790260104839. 22.5 x 16.5 cm inches. 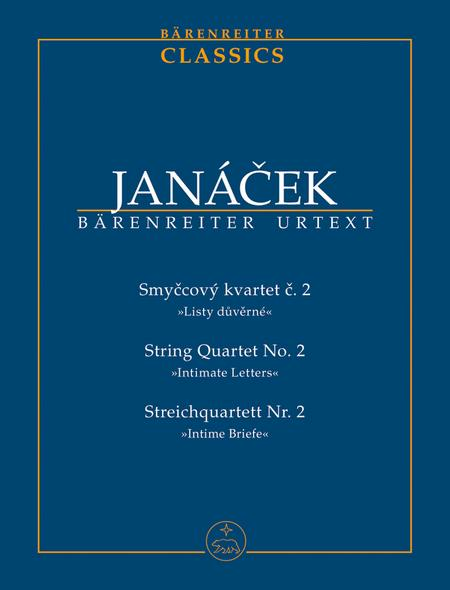 Janacek's 2nd String Quartet,Intimate Letters, is regarded as a highlight of the modern string quartet literature. It was written during the composer's last year of life, between 29 January and 19 February 1928, inspired by the ageing Janacek's exceptional love for Kamila Stosslova. The Moravian Quartet devoted themselves to this impressive work; Janacek attended a total of three of their rehearsals in May and June 1928. This had several consequences, including his abandoning his original idea of using a viola d'amore. 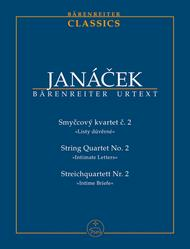 After Janacek's unexpected death (12 August 1928) the uncertain genesis of the work became the greatest problem of theIntimate Letters: the surviving copies were not definitively authorised.